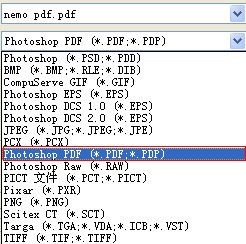 We always have so many file formats in our computer, we use MS Word to view .doc files, MS Excel to view .xls files, Adobe Reader to view PDF files, image viewers to view all kinds of image formats, and browser to view html files. It seems we need to install many programs to view so many kinds of file formats, and we have met a lot of people who wonder how to solve such problems. So can we transfer those files into one uniform and secure format? The answer is definitely yes, we are here to introduce how to convert all kinds of image formats into PDF format. Generally speaking, we have several ways available to convert images to PDF format. Here we show you 4 common ways to do such jobs. As we all know, Adobe Photoshop is used for image editing, but this tool also offers a lot of output formats which include the PDF format. We just need to import the wanted images (no matter it is .jpg, .tif, .png or others) into Photoshop and click "save as" and choose the PDF format, then the images appear as PDF format. As we all know, MS Word 2007 or above has the capability to save word files as PDF's. So with the help of MS Word, we could easily convert images to PDF format. 1. Create a blank Word file. 2. Click "Import"->"Images" and select the wanted pictures to import. 3. Save as PDF format. Advantange: We could import several images at one time and output to one pdf. And remember to select the output format to be PDF(or any other format needed). Besides converting word/excel/ppt to PDF format, many desktop PDF converter tools also can convert images to PDF format. For example, nemo all to pdf can convert several formats (including word/excel/ppt/html/txt/images) into PDF format. With the help of the batch conversion feature, we can convert several files at once, which saves us a lot of time. There are also other desktop tools available, but they all are easy to use. Just "Add files"->"Customize"->"Convert", and the jobs will finish automatically.